only compare yourself to you – Love. Life. Practice. editor’s note: the first draft of this post erroneously named “Niall Ferguson” as the author of Disrupting the Rabblement, when it is, of course, Niall DOHERTY. I apologize for the mistake; then again, I also wrote “Lannister” instead of “Bannister” in the first draft, which I completely blame on George R.R. Martin. A couple of days ago Niall Doherty gave me a gift. I like Niall a lot; in some ways he’s living a life I might have wished for, traveling the world and experimenting with entrepreneurship and making up the rules as he goes along. I’ve done all those things too, I just haven’t done it with anywhere near the exuberance and panache that Niall has. Do yourself justice. Compare yourself to people who inspire you, who drag you up, not pull you down or keep you coasting. 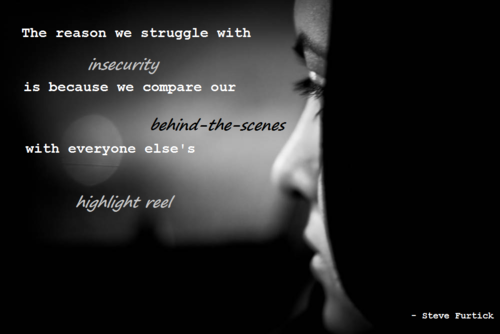 There’s little point comparing yourself to your peers. Raise the bar. Get to the next level. And that was a gift for a blogger like me who has to write a post about life, because that is one concept that I completely disagree with. The only metric that I think is useful to compare yourself to is you. To use any other standard of measurement is simply asking for failure. there should be zombies behind them, don’t you think? May 6, 1954. Roger Bannister, an English runner, becomes the first man to do the impossible: he ran a mile in .6 seconds less than four minutes. People had said it would never be done, for as long as there had been minutes, and he had done it! 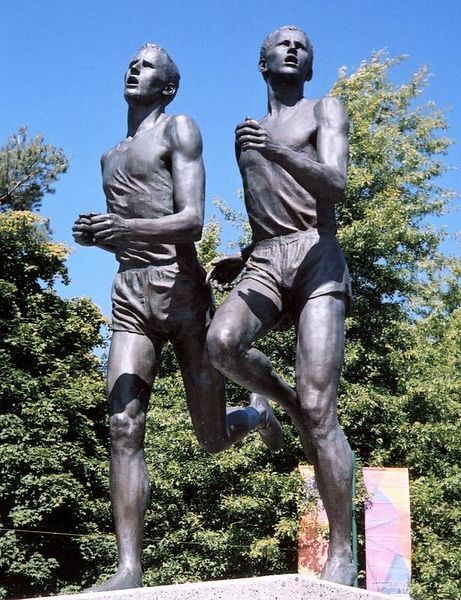 Two months later he did it again…but so did another runner,Australian John Landy, who lost the race but became the second man to break the four-minute barrier. In the over fifty years since then, the idea of the four-minute mile has become kind of quaint, with seventeen more seconds shaved off that time. I don’t mean to diminish the achievements of Bannister, or Landy, or anyone else. My point is that the moment you reach a milestone, there are two things that happen: one, there is someone else right then trying to push it further, and two, you yourself are moving away from it – either forward to a new one, or succumbing to the weariness that age brings us all. Depressing, eh? Somewhere there exists a photo of me the day I graduated bootcamp. In that picture, I have washboard abs. I am cut, I tell you. But as a desk-bound middle aged white guy, the goal of trying to have those abs again – or really to have anything resembling that 19-year old body – would be at best a thorough distraction and at worst a vast disappointment. And that’s ok, because I’ve learned to set my goals more simply. I don’t want to be richer than I need to be to feel secure – whatever that might mean. I’m not going to set an arbitrary number, nor am I going to try to make more money than other people my age. The rush of beating someone else – and it is a rush, I’ll give you that – is far more fleeting than the simple joy of contentment. That’s not to say I’ve found contentment, of course. But occasionally I catch a glimpse of it, and I’m pretty sure it’s awesome. To be fair to Niall, he did moderate his stance somewhat. “…yes, I realize that there will always be someone doing better than me, always someone I won’t compare favorably to…I’m not really looking for a finish line. I’m enjoying the process.” That’s a great way to look at it, and I think it’s some common ground that he and I share (he said as much in the comments, in fact). We both are trying to become versions of our better selves, whatever that might look like. I still don’t like the idea of comparing yourself to any external metric. I am haunted by a friend of mine, a fellow performer at a camp who was trying to fill his rehearsal time at one of the camps. I saw him filling out his schedule over dinner, and he seemed troubled. “I need to find someone to work with from 4 to 6,” he said. “The best WHAT?” I asked, feeling more troubled for my friend than I think he’ll ever know. “The best there ever was…” he replied, and walked off to find his practice partner. I hope that he meant the best version of himself…but no, I don’t think so. I think he wanted to be the best at what he does. And I fully believe he may make that goal. But I worry about what he’ll do after that, when a younger, stronger, fitter dancer comes along, one who has his eyes set on new goalposts. Goalposts that my friend didn’t have, because he’s the one who created them. Me, I’ll avoid the bullying of words like “best” and “most” and “top” and “first”. I’m ok with “happier” and “joyful” and “beauty” and “grace.” Kaizen: better and better, bit by bit. Here I am, playing a character who is pretending to be a character that’s working to be a better character. What if I stop for just a moment? What if I let myself really notice the game I’m playing? What then? There’s nothing left to compare because all of it’s from me and none of it’s real. And then, it’s time to do the dishes. The only problem with that is that games are fun, and humans are predisposed to tell stories about themselves and others. Taking yourself out of the narrative is, I believe, simply a different narrative (until you reach enlightenment, of course, at which point you simply are able to open and close the book as you like). As for “what then”, I agree: the dishes need to be done. Noticing the game is not the same as removing myself from it. It’s simply allowing myself to move from being caught in a nightmare to lucid dreaming. No nightmare? No problem. Thanks for furthering the conversation here. Your Roger Bannister example is in line with what I was saying. Before he beat the 4-minute mark, many people didn’t realize it was possible. 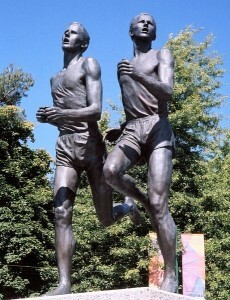 Then be beat it and it inspired other runners to try get to that level. And several of them did. I wonder, would they have become that best version of themselves if they didn’t compare themselves to Bannister? Of course I also agree that it’s a slippery slope. You can take comparisons way too far and end up reaching for the impossible and getting depressed when you can’t match someone else’s output/success. A great book on this topic is The Inner Game of Tennis. The author writes a lot about the ultimate competition being internal, trying to be the best you you can be. Thanks again for writing this, and for your comments on my blog. This is me hiding my head in shame; does it mitigate the error at all that Niall Ferguson is also a pretty great author? I have fixed it. I guess my counterpoint to your comment about Bannister is: what if he had only compared himself to others? In order to do the impossible, he didn’t have anyone else to inspire him, so it was only by pushing his own limits that he was able to achieve what he did. I think maybe the answer is to measure yourself by yourself but chart your path by those who inspire you. Or something more cleverly stated when I’ve had more coffee. Thanks for the book recommendation, and for visiting my humble blog. You, sir, are an inspiration to me.